Does Religion Play a Positive Role? 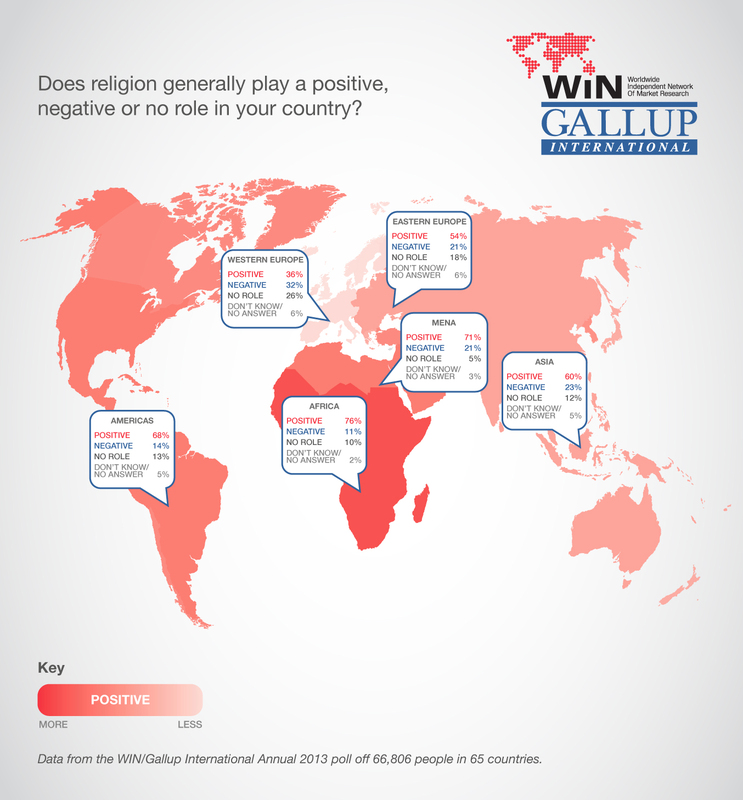 Zurich, Switzerland: 17 April 2014 – A global poll by WIN/Gallup International has revealed that over half of respondents believe that religion plays a positive role in their country, with people in Western Europe recording significantly lower positive results than other regions. In the run up to the Easter period, WIN/Gallup International has released findings that show just over half (59%) of the 66,806 people polled feel that religion plays a positive role in their country. This, however, is not a sentiment reflected across all the regions, with Western Europe showing a low net positivity (the net score is the total positive percentage less the total negative percentage) at only 4% – a figure that is significantly less than the global average (37%). When compared to other regions, there is a notable step to Eastern Europe at 33%, followed by Asia at 37%. This lower positivity in Western Europe may be attributed to the secular nature of the region in comparison to other parts of the world. In total there were nine countries whose net scores were negative when asked about religion, with six of those falling within Western Europe (Belgium, Denmark, France, Netherlands, Spain and Sweden). Of these, Denmark was the most net negative at -36%, followed by Belgium (-30%), France (-22%) and Spain (-22%). By contrast, the most net positive country in this region was Iceland (43%) followed by Portugal (39%), which may be due to these countries having one dominant religion. On a global scale, the most net negative country was Lebanon (-43%). While Western Europe may have come in significantly less positive than the other regions polled, there is generally a positive belief in the role of religion elsewhere in the world. The most net positive region globally is Africa (65%) followed by the Americas (54%) and MENA (50%), and these high response rates may be due to the less secular nature of these regions. The most positive country globally was Indonesia, with 95% stating religion played a positive role, whilst, as a comparison, the USA and the UK are both net positive at 43% and 6% respectively. Religion still holds great importance in the US with 62% of respondents saying religion plays a positive role in the country, culminating in net positivity of 43%. This shows that the majority of US respondents hold religion central to their values, something which is still reflected in the country’s politics – and something this poll would suggest is unlikely to change in the near future. How do religious beliefs affect results? When analyzing the data by religion, a marked difference can be seen across the various religious groups in terms of their positivity towards the role of religion in their country. Globally, net positivity was 37%, however, of the major religious groups Muslims and Protestants both came in above the global figure at net positive 60% while Hindus were the least net positive at 24%. It is of note that a large proportion of Hindus surveyed are located in India where in fact net positivity is 19%.